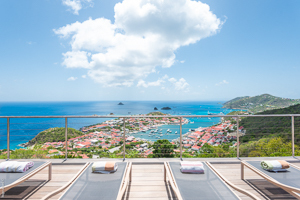 Villa UJV 182, also known as Ti Moun, is a charming 3-bedroom, 3-bathroom villa with spectacular 180-degree views from Shell Beach over Gustavia, all the way to the bay of St. Jean. Wonderful for sunsets. The living, dining and kitchen areas share one large room that opens out to a second covered living, dining area overlooking Gustavia harbor. Also on the main level, there are two bedrooms equal in size and style, each with its own modern, spacious bathroom and private terrace with a view of the sea. The sunny pool terrace has panoramic ocean views. It is the ideal location for relaxing and enjoying the sun all day long! The third bedroom is suitable for teenagers or nanny. Located on the lower level, it has an ensuite bathroom and a private outside seating area with garden and ocean views. This very private villa is a perfect getaway for two couples or a family with teenagers. PLEASE NOTE: During the Thanksgiving period higher rates apply. Please speak to a Wimco agent.